The foremost of the great projects for connecting by rail the Atlantic and Pacific coasts was realized May 10. At ten minutes past 3 o’clock p.m., at Promontory Point, Utah, the last rail was laid. The last spikes driven were presented by Nevada and Arizona. That from Nevada was of silver. "To the iron of the East and gold of the West," said the Hon. T. A. Tuttle, representing that State, "Nevada adds her link of silver to span the continent and wed the oceans." By a connection of the telegraph with the last spike (a gold one, from California), the last blow given announced to the world the completion of the grand enterprise. A prayer was said by Rev. Dr. Todd, of Pittsfield; then the two last rails were laid simultaneously, one opposite the other—one for the Union Pacific Road, and one for the Central Pacific Railroad; the presentation of spikes and the responses followed; then the last spikes were driven by the two companies, and telegrams were sent to the President of the United States and to the Associated Press. This is, indeed, a great event of the world; it is one of the victories of peace—a victory grander than those of war, which leave in their track desolation, devastation, misery, and woe. It is a triumph of commerce—a triumph indicating free trade as a future law of the nation…When we contemplate this achievement we can hardly realize its magnitude. Three thousand two hundred and eighty-five miles of continuous railway within four degrees of latitude and fifty degrees of longitude in the temperate zone. It begun when the nation was agitated by war, and is finished now when we enjoy a reign of peace. When the ocean route was discovered around the Cape of Good Hope, it was very properly regarded as a blessing to mankind—hence the designation by which it is known; but the completion of this mighty work, which connects the two oceans, is a still greater blessing. In the olden times, when camels—those ships of the desert—were the means used for transportation, for the furtherance of commercial traffic, it was found that wherever the caravans stopped there would spring up cities, and there would be evidences of civilization. So with this great work. It will populate our vast territory, and be the great highway of the nations; their merchants will cross it to trade with us. But there is another aspect in which we view it as a blessing, and in connection with which we esteem it of still greater importance. It will preserve the union of these States. Philosophers tell us, and we know it is to be true, that where there are rivers which diverge in their courses, and have separate and distinct outlets (as in Europe), there the nations become diffused, and the peoples are separated and disunited. But where, on the contrary, the topography is such that the rivers all flow into one common central basin, there is necessarily a concentration of interests and of peoples, and that territory is marked out by God to be under one Government. By the operation of this natural law we must regard it as decreed that there shall ever be a unity of people and government in all that territory which lies between the Alleghanies and the Rocky Mountains. Beyond these lofty heights, however, we find the rivers diverging, as in Europe, and, following the rule that obtains in the Old World, there might be a diffusion of interests and a separation of governments in that section of the country divided from us by the Sierra Nevada and the Rocky Mountains. But this railway counteracts such natural tendency to disunion, has prevented a separation, and binds the States of the Atlantic and Pacific into one nation. Roman roads unified and consolidated the Roman Empire. They were made by the ambition of Emperors for the necessities of war and commerce; but, under Divine Providence, they were the highways along which the Apostles and the missionaries of Christ carried the good tidings of salvation to the tribes of the peoples. So this Pacific Railway is a means, under Divine Providence, for propagating the Church and the Gospel from this, the youngest Christian nation, to the oldest land in the Orient, now sunk in Paganism and idolatry, and so will revive the worship of the Triune God—the God of our salvation—in the farther East, the birth-place of Christianity. Let us glance at the history of this enterprise. It is closely connected with the political developments of the last twenty years. At the close of the Mexican war, in 1848, California, New Mexico (including Arizona), and Texas were added to our territory, so that from the 32d to the 42d parallel of latitude there was no foreign domain between the Mississippi and the Pacific coast. The very next year thousands of miners from every quarter of the globe flocked to the gold-fields of California; the greater number by sea, but very many through the Eastern States and over the unexplored regions of the far West, by what soon came to be known as the overland route. The necessity for a trans-continental route then became evident. Hon. 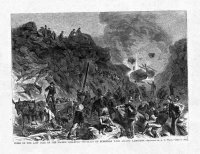 Thomas H. Benton, of Missouri, introduced a bill into the Senate in 1850, authorizing what may be called a stepping-stone railroad, consisting of links of railroad interrupted occasionally by what were then supposed to be insuperable natural obstacles. Three years later Congress appropriated $150,00 for six surveys of proposed routes for Pacific railroads, to be carried on by the War Department, of which Jefferson Davis was then Secretary. Among those who had been prominent in advocating the claims of this enterprise before the people the foremost was Asa Whitney. Congress, in 1854, appropriated $190,000 more, and three additional surveys were made. The great problem of the engineers was how to overleap the Rocky Mountains, running through the center of the vast trans-Mississippi region, which contains two-thirds of our entire territory. The Pacific surveys proved that this great grizzly bear had a very broad back, that the slope up his sides was very gradual, and that his spine did not extrude unpleasantly in the center, but lay, on the contrary, rather sunk between two row of muscles or mountains on either side. But very soon the Southern disunion sentiment cast a cloud over the political sky, and in this connection the important question arose, How would the Pacific States stand? Their isolated position was keenly felt, and thus an additional motive offered for a railroad between the Atlantic and Pacific coasts. The importance of California was beginning to be understood. Her gold, her cereals, her grape culture, her trade with Eastern Asia; all these facts commanded attention. She stood the test of the Civil War, and proved herself loyal. Her own growing importance led her not to isolate herself, but, on the other hand, to seek a more rapid and convenient communication with the East. It was discovered that there was a practicable railroad route across the snow-clad Sierra through Donner Pass, midway between San Francisco and Virginia City. Some of the richest Californian merchants pledged their entire fortunes to the realization of this project, the State Legislature gave its support, and Congress was asked to grant a fitting subsidy. It is needless here to describe the conflict which then sprang up between Chicago and St. Louis, each of which (the former backed by New York and the Northwest, and the latter by Philadelphia and the Middle States) sought to gain control of the eastern branch that was to meet and unite with that already proceeding from San Francisco. This was in 1862, when the Government was spending daily $2,000,000 in gold for the suppression of the Rebellion. It was in the midst of such a contest as this that in July, 1862, President Lincoln signed the act granting a charter to the proprietors of the Pacific Railroad Companies. The Chicago capitalists had gained the victory, and Omaha (on the Missouri River) was fixed upon as the eastern terminus of the road to Sacramento, 1721 miles distant. But St. Louis was to be provided for by a subsidized branch line, to connect with the main line on or about the 100th meridian. This was called the Eastern Division of the Union Pacific Railroad. The line from Sacramento to meet the Union Pacific was called the Central Pacific Railroad. These three companies were all chartered and stood on an equal footing as regarded land-grants, loans, mortgages, etc. Congress conferred upon the three companies the right of way, an absolute grant of 12, 800 acres per mile of the public lands traversed, and authorized a special issue of 6 per cent United States bonds, proportioned to each company according to the length and difficulty of the lines, to be delivered as the work progressed. The bonds issued by the companies themselves were given the position of a first mortgage. The two classes of bonds and the other capital for the construction of the Union and Central Pacific roads amount in round numbers to $150,000,000, about equally divided between the two. These two roads have been completed and the through line regularly established. On the very day of the opening an invoice of tea from Japan was shipped from San Francisco for St. Louis. The next day a telegram was received at the Post-office Department, Washington, from Promontory Point, stating that the mails had been delivered at that place for San Francisco. The cost of transmitting the mails by the Butterfield route was $1100 per mile by the year; by the railroad it is only $200 per mile. The transportation of Government supplies and troops is diminished in the same ratio. The advantages of the new route thus opened are obvious. Communication between Calcutta, Hong-Kong, and Liverpool will be measured by days instead of weeks. Facilities for the interchange of merchandise will tend to the rapid development of our national resources. Immigration will receive the aid of a most powerful auxiliary. What will grow out of the close connection thus established with Eastern Asia time alone can reveal. We are not disposed to be imaginative. Looking only to what is real and tangible, it is certain that no work of this century can compare in the grandeur both of the undertaking and of its probable results with the Pacific Railroad. 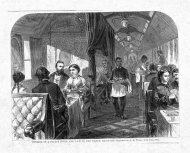 One of our illustrations on page 348 shows the interior of one of Pullman’s Palace Hotel Cars. These cars have all the accommodations of a first-class steamer—state-rooms with spring-beds, and meals served to passengers upon tables completely furnished. The passenger from Chicago to San Francisco will take a state-room, go to bed at night, and have breakfast, dinner, and supper on board the train while flying across the continent. The other illustration on the same page shows the workmen—a medley of Irishmen and Chinamen—engaged in constructing the last line of the railroad. Thus the very laborers upon the road typify its significant result, bringing Europe and Asia face to face, grasping hands across the American Continent.